The Foreign Ministry today distributed €90,526 in Overseas development Air to help Maltese projects in various countries. Applications for the funds were evaluated by a seven-person Advisory Board from the Ministry’s Development Unit anddevelopment related academia and civil society. 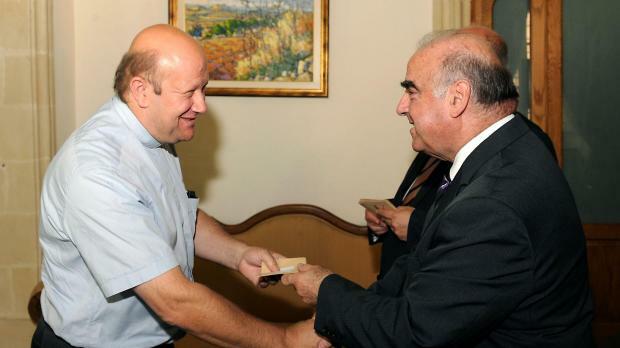 The grants were handed out by Foreign Minister George Vella. The general objective of the project is to contribute to good governance at state level, by implementing a model of conflict-mitigation in the city of Jos. The specific objective is to keep away from the culture of violence those youths who usually participate in the fighting that affect the city of Jos, through a programme of psychological and economic rehabilitation and reintegration in the social life and the economy. This project involves the completion of internal and external finishing of two shell form buildings which will be used as dormitories for 300 boys and girls under the age of 15 who are all physically and/or mentally disabled. Phase 2 of this project involves the financing of classrooms, bathrooms, a safety perimeter, new furniture and equipment and the refurbishment of a staff room in the school. CAM Youths aims to offer the most needed and up-to-date courses that will help the beneficiaries to obtain better opportunities. Music tuition will be prioritised as it is central to the youth’s cultural and social life. Other practical courses which can help in providing young people with useful skills which will help them find employment. One of the main difficulties faced by parish goers is day to day sustenance. Here, many children, families and the elderly regularly go to bed hungry. This project aims to install kitchen facilities in one of CAM’s parishes, which will contribute to providing the most vulnerable children and their families with nutritious food. The HopeXchange Ghana Health Project is a collaborative international humanitarian effort aimed at increasing the healthcare capacities in the Sub-Saharan Africa. Support is being sought to secure the prompt financing to equip three state-of-the-art operating theatres and intensive care unit. The project aims to continue with the furnishing of classes and a science laboratory which will provide learning opportunities for local children coming from poor families. These will help to give the best training to about 400 destitute children who otherwise wouldn’t have access to such important educational tools. The complete project will provide an appropriate and safe environment conductive to substantially improve the lives of thousands of students and reduce the risk of the current deficiencies. The facilities will be used to hold workshops, seminars or weekend gatherings and as a healthy study/accommodation centre for High school, college and University students. This project will provide missing furnishings for a school social centre, which is used to distribute food for the poor and for talks and formation given to pregnant women and the poor. A group of 10 Maltese volunteers including the director of the applicant organisation will be travelling to Mapinhane in Mozambique to help in the implementation of the project. This project involves the purchase of an ambulance, which will ensure better and more efficient service, in reaching out to people living in remote hamlets and hardly ever see a doctor in their life. The project involves the covering of the school podium area with a roofing structure. The podium is a central part of the school and is needed because for much of the academic year since the sun is very strong. It will be used for activities such as daily assembly and extracurricular activities. This project will aim to improve productivity and production quality of the surrounding farmers with skill and technological transfer; reduction of unemployment, improving both household and gross income of the area. The project plans to address the issue of social and economic problems of the area particularly with regards to gender and minority issues. Fr Gauci submitted a second proposal for the continuation of the construction of a sports complex in Juticalpa, Olancho, Honduras. This complex is to be used by youths in their free time with the aim of keeping them away from drugs. This project is to be built on the grounds of an existing parish centre and this will be done it in two phases. The first phase will consist of a dining room, kitchen, four dormitories and toilets. This infrastructure will be used for day-events and a limited number of youths.